USB-C might be a wonderful, do-it-all standard, but many of the low-cost accessories and cables that you’ll find on the market today don’t follow the proper USB-C spec. Some are even dodgy enough to cause damage to your USB-C devices. But it’s not easy to tell which ones are compliant and which ones aren’t. Avoiding ridiculously cheap USB-C accessories is a good idea, but even some of the pricier ones can be hit or miss. In fact, even Apple has shipped some dodgy USB-C cables. Its original charging cable for the first 12-inch Retina MacBook had to be recalled last February because it wasn’t properly compliant with the USB-C standard and had trouble charging the MacBook properly. 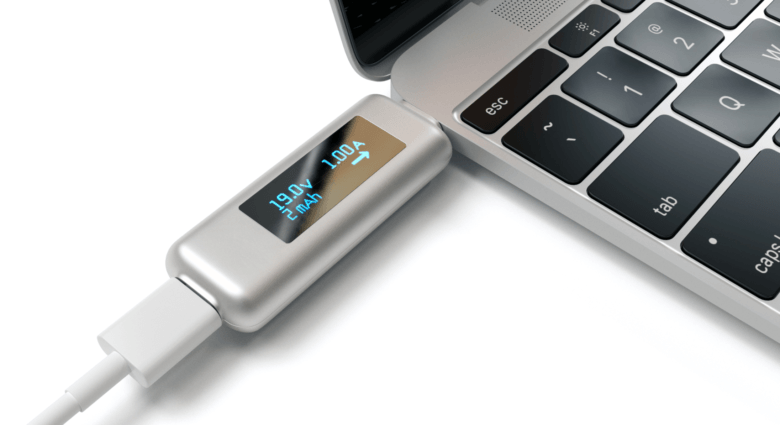 With the Power Meter, you can take the guesswork out of it.he Power Meter plugs into the USB-C port on your Mac, and then the USB-C accessories you want to use connect to the other side of it. As soon as it detects power, the device comes alive and shows you the current and voltage being passed through it in real-time. It also shows the direction that power is going, and how much has been drawn or received since you plugged the accessory in. And because it uses USB-C, you can use it with other devices, too — like smartphones, tablets, and third-party laptops. You can then use this information to establish whether or not the accessory you’re using is safe. It can also be used to confirm that the accessory delivers or receives as much power as its manufacturer intended. Sadly, the Power Meter cannot block power if it detects too much is being drawn from or passed into your MacBook. That means if you plug in something that could fry your machine, it still has the potential to do that before you get a chance to work out it’s unsafe. But if you want to keep an eye on your USB-C accessories, you can order the Power Meter from Amazon today for $29.99.